Today, there will be no review. In its place, however, I would like to discuss an issue of personal interest and concern to me. Two years ago, I received my first email from a company offering to send me samples of their beverage to review on this site. 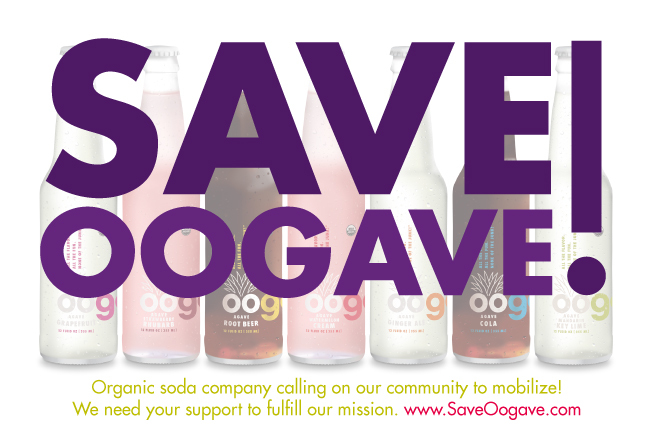 Now, almost four years after their instantiation as an independent, health-oriented, organic beverage company, Oogave is in need of our help. For those who are unfamiliar, Oogave is an independent soda company that produces a line of all-natural sodas sweetened with organic agave nectar. Oogave is a delicious, refreshing, and unique beverage in a market segment so often fraught with tiresome non-originality, and anyone who has the opportunity to try it should do so without hesitation. But while Oogave produces an amazing beverage, the company has found itself in a bit of a financial quandary this year, and has turned to the beverage community for assistance. I don't want to belabor the point too much in this post, as Oogave has explained the situation in full in the description of their Indiegogo campaign, but the basic gist is this: Oogave needs $500,000 in donations (consider them "community investments, if you prefer) if they are to smoothly continue production into the next several years. For a small, independent packaged goods supplier in the United States, it takes about five years of sales to reach cash flow positive--business terms for sustained profit. Oogave has big plans for the next several years (signing on with major distributors such as Super Target and Sodexo), and if they can make it through this critical fourth year, they should be set to succeed in the years to come. This, now, is where you come in. Oogave is currently a little bit short on cash in their plan for expansion into more major North American markets. Without the funds required to keep up with the costs of production, Oogave may be in danger of having to close their doors for good--something about which anyone who has ever tasted Oogave would be very upset. Oogave has estimated that they need approximately $500,000 in funds to reach cash flow positive, at which point they will be able to grow organically and continue seeking new opportunities for brand-building and expansion. If they can reach this goal, Oogave will stay in business and will continue to grace the beverage industry with their delicious products. If not, well...the future is very unclear. If you are interested in helping Oogave reach this goal, head over to their Indiegogo fundraiser and take some time to read through their explanation of the issues at hand before determining how much money you might be able to contribute to the cause. Each level of donation does come with a corresponding reward perk, so if you are on the fence about bumping your donation up to the next level, just know that you will see some return on your investment (aside from a great company getting to stay in business, of course). If you are unable to donate, you can still do your part by sharing the information about the campaign with your friends, family, and social media networks. $500,000 may seem like a long way off, but every little bit helps. If we all work together in donating and doing what we can to get the word of the campaign out to others, we should be able to help Oogave stick around for the long run. For more information about Oogave and their products, please visit their website at: www.oogave.com. Help get the word out with Facebook and Twitter, and be sure to share the link to their Indiegogo campaign (http://www.indiegogo.com/saveoogave) wherever you see fit.